Ah, the magical lemon--rich in vitamin C and antioxidants, highly acidic yet able to alter the body’s pH to alkaline, and delicious, especially when combined with honey. Used for centuries to relieve cold symptoms, it's added by moms and herbalists around the world to a variety of concoctions to help us feel better. The lovely lemon helps relieve cold symptoms and is a favorite weapon against the rhinovirus, which is responsible for the common cold. Add one cut-up lemon and half an onion to 16 oz. of water in a pot. Bring the mixture to a boil, then allow it to cool and steep at the same time. After 15 minutes, remove the pulp and drink several times during the day. This mixture helps reduce mucus, but tastes unpleasant. Add a little honey for taste. 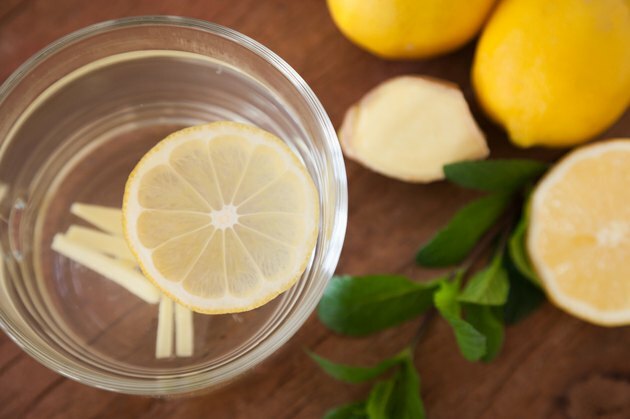 Slice up a lemon and boil in water for eight minutes. Strain off the pulp and pour the remaining juice into a glass. Add 2 tbsp. of glycerin, stirring well. Allow the mixture to stand for 10 minutes, then add 1 tbsp. of honey and let it sit for another 10 minutes. Take a spoonful to soothe a sore throat once or twice a day, suggests Jethro Kloss in his book, “Back to Eden." Mix together 2 tsp. honey, 2 tbsp. lemon juice and a cup of boiling water. Add a tea bag of mint tea and bring the mixture to a soft boil. Allow all ingredients to steep for 15 minutes. Remove the teabag and drink. The tea helps to decongest, the lemon helps reduce mucus and if you sprinkle a few grains of cayenne pepper in, this helps reduce body pain and a sore throat, suggests Penny Royal in her book “Herbally Yours." Slice up about 1 inch of raw ginger and mix in a pot with half a lemon and 8 oz. of water. Bring to a boil and allow the herbs and fruit to steep for 10 minutes. Add one spoonful of honey and remove the pulp. Drink it as a decongestant that reduces mucus and soothes the throat. A clove of garlic may be crushed and added to steep with any of the drinks to add extra antioxidants and some of garlic’s amazing healing nutrients. The information offered here is for educational purposes and is not meant to replace medical advice.